And some week it was! In early March the spotlight is always on the position and rights of women because of International Women’s Day. This particular week was no different. 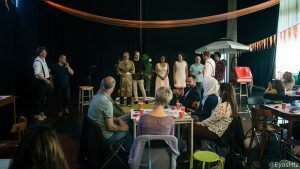 Last month, together with other neighbourhood communities, we organised the meeting Women at the Wheel about female leadership, in Pakhuis de Zwijger here in Amsterdam. Our partners were Framer Framed with their project ‘The City is Ours’, the activist Santi van den Toorn, and Bloei & Groei. It was such an energizing night, with several generations of women ranging in age from 16 to late 70 sharing their experiences and activist projects. What soon transpired is that the younger generations of women have found their own ways. On Tuesday I was invited by the HVA (Amsterdam University of Applied Sciences) to attend the launch of the book Art in Social Work Practice. Now, in my work and my thinking I’ve always been motivated by a crosspollination between the social and the artistic. This book covers a lot of ground and explores participatory art practices on various continents. Personally, I could relate very well to the presentation of the University of Applied Sciences Ghent. They clearly demonstrated how giving a voice to people has evolved into giving a stage. That is exactly the development we have experienced ourselves with ZID. 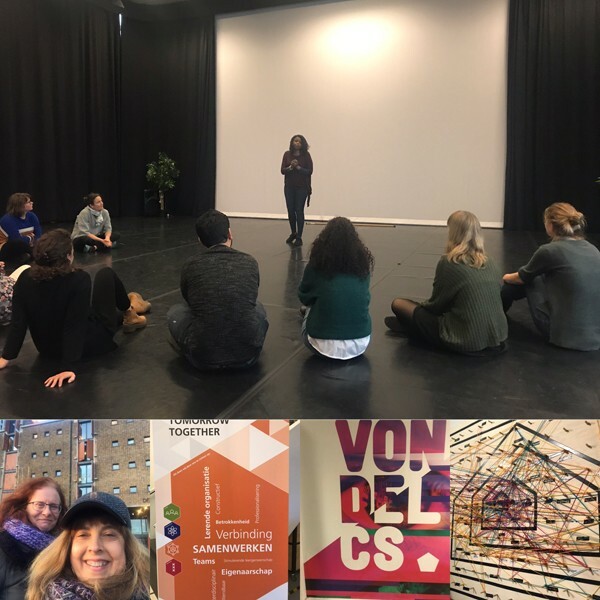 Then came Wednesday: a meeting organised by the city district West in VondelCS (at the AVRO/Tros Media and Culture LAB) about the current state of art and culture. It included a discussion with the chairwoman of the Amsterdam executive committee for Art and Culture, Touria Meliani, and city district chairwoman Fenna Ulicki. They talked about organisations based and working in West and about collaboration with larger institutes such as the Van Gogh Museum and the National Opera and Ballet. How can we find a balance between the latest developments in art and culture and the needs of the population of such a diverse and multicoloured city as ours? A city with a traditional cultural structure that goes back many years. Where is the meeting point between high and low art, between the established culture makers and the ‘regular’ people living in the city? What new roads could we take to collaborate effectively? This is a complex issue, in which different voices can be heard. 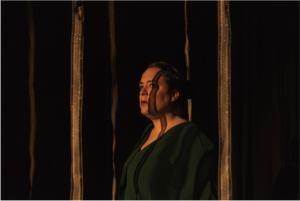 Over the past few years, in our own collaboration with the ensemble of the ITA (International Theatre Amsterdam) we have consistently tried to come closer, beyond the rigid structure of a formal collaboration. This isn’t easy, as each organisation has its own DNA and its own priorities. 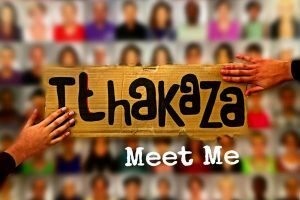 Where is the meeting point, the point from where we can start complementing each other? Thursday was the day that Netwerk Democratie asked us to welcome the students of DAS Theater—the Master study programme at HVA—for a three-hour work session and explain to them the essence of our work at ZID. I named the session: How to Work in Co-Creation Between Professionals and Non-Professionals. Sebo, Daan and me—ZID’s entire artistic core team—put together a programme about both our practical approach and the dialogue we seek. Recurring elements were examples from our practice, and brainstorming together. What I find interesting is how our methods and our game StoryCatcher met with such great enthusiasm, and not for the first time. Again, we were asked when it would be published in English, as this group of students from Israel, Iraq, Italy, Latvia, the Netherlands, and Greece was very keen on using the game in their own practices. And so we come to 8 March, International Women’s Day. I decide to attend the opening of the exposition ‘The City is Ours’ by Framer Framed in Werkplaats Molenwijk, as I want to come even closer to this project, an artistic collaboration about public space for young women in Amsterdam and Tunis. The small venue, enclosed by blocks of flats, is packed with people and the atmosphere is lively. It is so great to see—and listen to the stories of—these young women between 18 and 22 who all try to occupy space in their own way. Space that is not always granted as a matter of course. I hear about doubts and problems, in which the theme of security is most prominent. Young women do not always feel safe in public space in Amsterdam. They are courageous and they take action, but as a society we should definitely not underestimate this problem. And the week is not over yet. On Saturday, with my daughter, I watch a very thrilling film: The Hate U Give. It is so exciting and painful that I wonder if there will ever be an end to the inequality in the world. In fact, the theme of equality, or rather inequality, somehow dominated the entire week. Equality between men and women, equality in creative processes between professionals and local residents, equality of race, gender,and social class, and equality in claiming public space. On Sunday we do rehearsals for Ulysses, with four actors from three continents, speaking three different languages. Their worlds and personal experiences meet in a universal space, looking for a home. With this new adventure we aim to make feelings of (in)equality the subject of discussion. Not as a debate, but by entering into a dialogue, with theatre, dance, and poetry. Because art has the power to express the repressed feelings among people in such a way that everyone who is there realises that change is in the making. And that was one of the little revolutions of this week, as every day and every meeting was a step in that direction. And of course, there is running the venue in the day-time, right? Would that be female leadership?